You are interviewing a person for a senior management position within your company, and you’re keenly observant of the interviewee’s behaviour. After all, first impressions are key, right? He then goes on to tell you that he has low regard for your company, and you should be grateful that he even bothered to grace you with an interview. He explains that he brooks no interference from anyone, bullies those he dislikes, expects maximum reward for minimal effort, will come to work each day at a time of his choosing and leave when he wishes to do so, will not tolerate any authority, rules or policies and will claw his way to the top by viciously shoving aside, stabbing in the back or maliciously ruining the reputation of those who cross him in any way. Naturally, you hire him on the spot and offer a silent prayer for how fortunate you are to have found a candidate of his calibre. It is highly doubtful an interview like that has ever taken place, yet stories abound of people like our mythical candidate wreaking havoc in workplaces after they’ve been hired. Clearly, they were able to cultivate first impressions that bear no correlation to their real selves. They can do so for one reason and one reason alone: because they understand the expectations necessary to make good first impressions when applying for a job, are always on their best behaviour during the recruiting process, and continue that way for the first while after they’ve been hired. This is a similar pattern, familiar to those who find themselves in abusive relationships. Even the worst abusers on the planet know better than to reveal all but their very best behaviour on the first date. As we evaluate candidates or try and get to have a sense of the person out with us on that first date, it’s crucial to be aware that the behaviours we are being presented with may not be those we will be living with, should the relationship – work or personal – continue. The most offensive work colleague and most nightmarish beau, while perhaps skillful at disguising their true selves in the early stages, will eventually become who they really are because they have trained themselves through repeated performance to do so. In other words, negative behaviours are habits that become deeply embedded within the persona of these folks. And their perfect behaviour during the interview/first-date phase is also a habit, one experience has taught them is a prerequisite to progress to their more familiar state. I am often astounded by the naivety of people who make bad hiring choices, find themselves in one bad relationship after another, rent their properties to destructive and irresponsible tenants or otherwise find themselves in a situation unlike anything they imagined. Of course, they were. We are naturally on our best behaviour when trying to make a first impression but beware because the person we first meet may not be the person they really are. Most behaviours are habituated within us. Habits, like addictions and all other challenges, cannot be fixed or changed until they are acknowledged. In the same way that politeness is a habit, so too is rudeness. Respect and disrespects are opposite ends of a continuum and both are the result of learned behaviours, resulting in habitual behaviour. While it is always easier, and let’s face it, more fun, to recognize weaknesses in others, at the end of the day you are the only person you have any influence over. 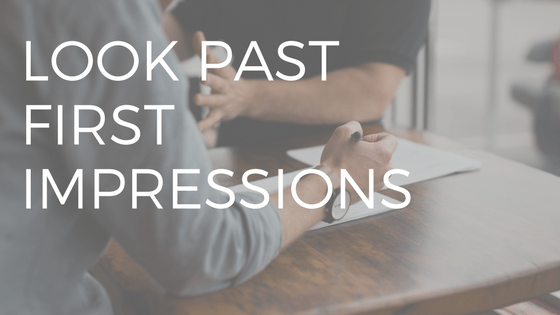 So carefully consider your first impressions, and how closely they resemble who you are. Now you have something of significance to focus on.